MADAM Aishah Akil began helping job seekers while working for the National Trades Union Congress (NTUC) a decade ago, at a time when many were being retrenched. The aim then was simply to get them into jobs, even if they were not an ideal fit. "Jobs came in, clients came in, and we just sent them for job interviews," she said, admitting that the success rate was low. "A lot of the time, there were skills gaps." Now 48, she is a senior employability coach at the Employment and Employability Institute (e2i), where she still matches people with jobs, but goes much further. The institute takes into account not just hard skills, but also passions and personalities. This in-depth approach is especially important as e2i is seeing more job seekers who are professionals, managers and executives (PMEs) or young graduates. "We have become more refined in our approach," said e2i chief executive Gilbert Tan. "Besides assessing skills, it's a conversation about what their passions are." 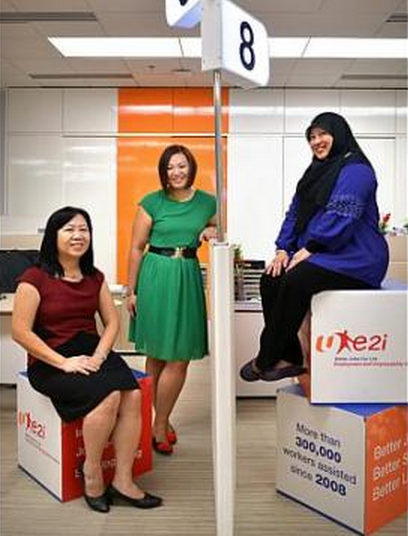 NTUC's job-matching services moved to e2i when it was set up in 2008. There are now 20 coaches, up from three a decade ago. The job has become more complex, involving skills such as personality profiling. Said senior employability coach Foo May Ling, 47: "We look at personality traits to match them with jobs they're suited for." For instance, a worker who prefers structure and detail could do well in accountancy. This approach suits the new generation of workers, said Mr Erman Tan, president of the Singapore Human Resources Institute: "They are better educated so they have higher aspirations." A few years ago, PMEs made up only one in five job seekers approaching e2i. Now, the ratio is one in two. There are also more young workers. "Three or four years ago, you didn't see fresh graduates," said senior employability coach Noel Choh, 39. Now, workers under the age of 30 form about a quarter of e2i's walk-in cases. They appreciate it when coaches factor in their interests, said Ms Foo: "Younger ones want jobs that can fulfil their passions." Coaches have adopted a similar approach at Mendaki Social Enterprise Network Singapore, the Malay-Muslim self-help group's training arm. "(They) go the extra mile to first appreciate the situation of clients," said social programmes and services head Lily Sulastri Mohamed Yahya. For instance, for those needing financial help, coaches will advise them on training subsidies and "help them overcome or reduce the financial barrier". The e2i employability coaches will be at Career and Education 2015 to give career guidance to job seekers, and help them apply for jobs on the national Jobs Bank online portal. The event will be on at Suntec Singapore from Thursday to Saturday.